Have you ever seen a cover that made you feel things? Like, at the bottom of your soul you were being screamed at by this cover that this would be one of the best books you have read in your entire life? My Shadowhunter Chronicles trash heart has experienced that with Chain of Gold. 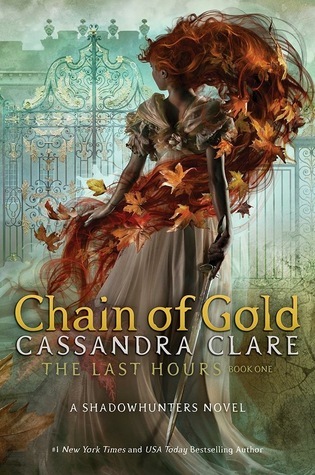 I’m not sure if it’s because the cover launched straight after I had finished Queen of Air and Darkness but I knew that The Last Hours series is going to be Cassandra Clare’s best work to date. I think the cover says it all because it is stunning. Honestly, Chain of Gold has me feeling certain ways and the book isn’t even releasing until November 2019. I find that most of Cassandra Clare’s books have darker under hues – at least TDA and TID. Chain of Gold seems to break away from this hold and be filled with a green that honestly inspires me to become a better person. This cover, and the contrast of the red hair on the cover, makes such a gorgeous composition. My only complaint was that the cover artist should have rolled back a little and allowed us to see the beautiful POC that is the cover artist – a Persian woman, as Cordelia Carstairs is. I also love the use of Cortana. AKA, the Carstairs weapon. Gosh, it is just so beautiful on that cover, don’t you think? I’m a bit of a weapon nut, as in I fawn over them and have no knowledge on how they work, and it is just gorgeous. The background is also a dream. I know this book is set in London and I know I heard what that castle in the background is but considering I woke up at 3am with an overwhelming urge to write this discussion , I don’t have much effort to Google it. We will also have Carstairs on ¾ series which seems pretty damn awesome to the Carstair’s family because those people can’t seem to escape from pain and terrible life circumstances. To move away from the discussion about the cover for a bit. I am so damn excited for this book to release. I am anxiously awaiting to get more Tessa and Will interactions as parents – because I hate Jem. I want to see the pair of them bickering and talking about fiction and also parenting the hoards of children. I am excited to see what Cassie does to change the story up a bit because there isn’t really a line for her to follow in this one. It is a series that can wholly be it’s own since TID tied itself up pretty well and none of the problems from the future will play a large part. Welcome to Edwardian London, a time of electric lights and long shadows, the celebration of artistic beauty and the wild pursuit of pleasure, with demons waiting in the dark. For years there has been peace in the Shadowhunter world. James and Lucie Herondale, children of the famous Will and Tessa, have grown up in an idyll with their loving friends and family, listening to stories of good defeating evil and love conquering all. But everything changes when the Blackthorn and Carstairs families come to London…and so does a remorseless and inescapable plague. James Herondale longs for a great love, and thinks he has found it in the beautiful, mysterious Grace Blackthorn. Cordelia Carstairs is desperate to become a hero, save her family from ruin, and keep her secret love for James hidden. When disaster strikes the Shadowhunters, James, Cordelia and their friends are plunged into a wild adventure which will reveal dark and incredible powers, and the true cruel price of being a hero…and falling in love. That’s it folks! Those are my thoughts about Chain of Gold’s cover. I am utterly in love with it and am ready to die for Cordelia Carstairs – and Anna Lightwood. What are your thoughts on the cover? Do you love it? Do you hate it? Will you read this series? Let me know in the comments! I love the cover and I think it’s the most gorgeous of the Shadowhunter Chronicles! I can’t wait to read it and to see Will again! Welcome to my bookish blog, ambreads. I’m Amber, a 20 something who loves to read and write. I review and discuss books. Hope you choose to stay in my little corner of the Internet. Click here to be updated whenever I post via email.